"Kevin built our beautiful lakeside home on time and under budget even though the project included some unplanned additions such as an outside deck! When we were contemplating building, our friends treated us to many horror stories about the building process, and especially the builders. We need not have worried! From beginning to end, Kevin was the consummate professional; all stages of construction were well planned, scheduled and executed. All of Kevin’s contractors arrived on time, were conscientious and performed with excellent craftsmanship. We had many visitors to our project, and they all commented on the quality of the construction and work. We started out with a basic design that we really liked, and Kevin made numerous recommendations that improved the design and functionality of our home. During the time we were interviewing builders we were impressed by the recommendations for Kevin from our bank and other building professionals that have worked with him in the past.. Being first time builders we were probably quite a trial for Kevin; but at all times he was patient, calm, friendly, and wanted only to please us." "Working with Kevin was a great experience. We are extremely happy with our new home. The homebuilding process was much smoother than we expected, and that was due in large part to having a reputable builder. Kevin is a professional. 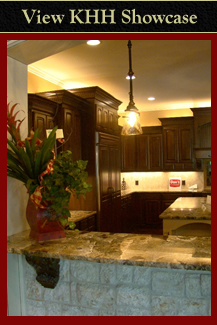 He utilizes talented craftsmen to build a quality custom home. He spent a great deal of time with us during the design phase making sure the floor plan was exactly what we wanted. The amount of planning that Kevin put into the home made the construction phase very easy. If we ever build another home, we will ask Kevin to build it." "When we decided to build a home in Tyler from half-way across the country, we knew the key to success would be an honest and trustworthy contractor. We were pleasantly surprised to be able to conduct business with Kevin on virtually a handshake basis. His design and construction ideas incorporated everything we wanted in a home. He kept us informed of progress (by long distance) and maintained tight budget controls. Kevin Humphrey exceeded our expectations, and put our concerns to rest. Our next home building project will not be a hard decision: Kevin Humphrey Homes will be our choice." "A little over a year ago, my wife and I began to look at building our first custom home. We had seen other homes that Kevin had built and we were always impressed with the workmanship and detail in Kevin's homes. Not only does he build a quality product, but Kevin is well respected by all the suppliers that he works with because of his professionalism and integrity. We couldn't imagine building our home with anyone else. He was so helpful and really led us through the whole process. He was always there to answer our questions and helped us make the most for our budget. We couldn't be happier with our home. It is exactly what we wanted and more!" "We were skeptical to build a year ago, when moving to Tyler, because of horror stories we had heard from others about new home construction. All of our fears were put to rest after meeting with Kevin for the first time. Kevin impressed myself, along with my OCD engineer husband, which is hard to do. My husband is very detail oriented and was assured by Kevin of the quality of his homes. The entire process from the design to the finish work included Kevin and his expertise. He often told us what would and wouldn't work, even if it meant he wouldn't make as much money. It was evident that Kevin wanted to build a quality home, but spend our money wisely. He spoke with my husband often regarding our home's status. Kevin told us up front that he only uses certain contractors and 'not just who is available at the time'. Kevin is particular with the contractors he does use and has a long term relationship with them. They are aware of his expectations. When shopping for lighting, construction loan, flooring, etc., the staff would comment on Kevin's 'great reputation' in the building world. We often heard 'they don't all work like Kevin does'. He is incredible at his job and we are very pleased with the final product. If we ever build in the Tyler area again, Kevin will most certainly be our choice for a builder." "Our home was constructed by Kevin on a cost-plus contract. We liked being able to see the invoices for the materials and labor services we were buying. Kevin talked to us during construction about building our house while keeping its future resale in mind. We recently decided to downsize, and sold our home after only two weeks on the market. Kevin is extremely honest, which is very important to us. We hope to build another home soon, with Kevin as our builder." "When we decided on the design of our new 4,400 sf home, we had to confront the obvious requirement that we would need to employ more than just an average home builder. Because the rough timber portion of our home would be built in Canada and shipped to Tyler, our contractor would have to deal with engineering requirements not normal in home construction. Specifications were exact and dimensions were rigid. In addition we decided not to use conventional framing for our exterior walls but to use pre-engineered panels to provide additional insulation. We were most pleased with the work that Kevin Humphrey performed. Not only did he handle all the complications and unique demands of our design, he completed the project within our budget and on schedule. We could not be more happy with Kevin Humphrey Homes and would recommend the company to anyone looking for an outstanding builder with talent, honesty and an obsession for quality." "What will set one builder apart from another is their attitude 18 months after you move into one of their houses. Kevin is not only willing to listen to questions we have, but he also responds. He does what he says he is going to do. Very refreshing in this day and age!" "We had a very positive experience building our new home with Kevin. We appreciated his honesty and his many design ideas and suggestions for cost-savings."